Who says the flowers have to be the prettiest part of the garden? 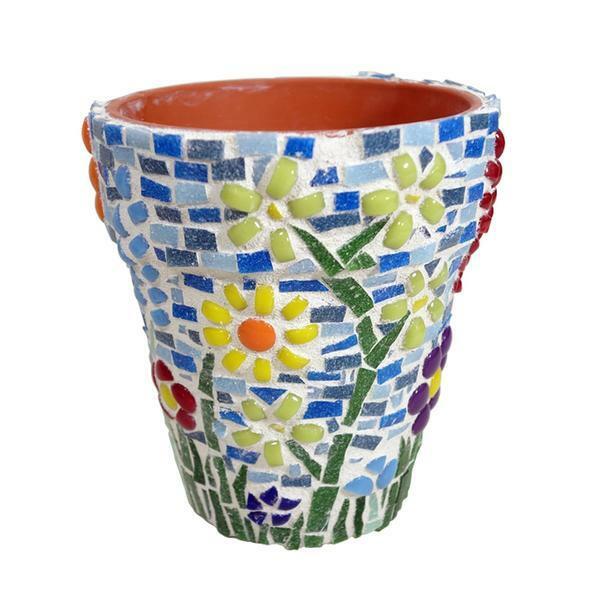 Mosaic your flower pots and make them the star! Be sure to leave about 1/8” between tiles to allow space for grout. Never dispose grout down any drain. Instead use a paper towel to wipe out mixing bowl, throwing excess grout in a trash receptacle. Cover the work area with newspaper or kraft paper. Wearing safety glasses, nip Mosaic Dots into half and quarter and use whole to fit the patterns. Next nip the lightest greens from the Grassy Greens Mix into thirds to create stems. Place the pot on its side over a bag of beans or rice to keep it from rolling. Glue flower and stem into place, allow the adhesive to set for about 5 minutes before rotating and gluing the next flower. Continue gluing flowers into place to your liking, try alternating the heights and colors of the flowers to add interest. When you are finished gluing the flowers. Nip the darker greens from the Grassy Greens Mix into blades of grass. To do so; nip tile into thirds or quarters while holding the nipper at an angle to create random curved lines. Glue to the bottom of the pot between flowers, up to about 1- 1 ½ ”. Next nip the 3 lightest blues from the Denim Mix into small rectangles. To do so; nip the tile in half to form two rectangles, then nip those rectangles into quarters to make a total of 8 rectangles per tile. Randomly glue the blues into horizontal rows to fill in the remaining spaces. Allow mosaic to dry overnight. Mix 1 cup of white grout with enough water (about 1/3 cup) to achieve the consistency of peanut butter. With a gloved hand, smooth grout over tile, filling in the crevices. Create a beveled edge around the rim of the pot by angling your finger as you apply grout. Remove as much excess grout as you can with your hand. After 10 minutes, use a damp sponge or paper towels to remove grout haze. Allow to set overnight.